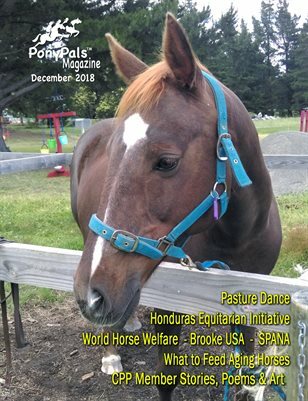 In this issue, readers can travel worldwide to learn more about horse rescue and care efforts in places like Honduras and North Dakota (Equitarian Initiative), Southern California (Brooke), Great Britian (World Horse Welfare) and Tunisia (SPANA). For horse people, these stories are the hope that show how we all care for equines, no matter where we are in the world. Finally, this month there’s an an amazing piece about pasture dancing with equines. The pictures say a lot about how it’s possible for people to get involved with equines in an artful way rather than dominating them.